This is only indirectly linked to Arctic sea ice, and something I found out today, but a little over two months ago emeritus Professor of Physics at the University of Colorado at Boulder, Albert Allen Bartlett, passed away at the age of 90.
world population was about 3.7 billion. People like Bartlett produce people like Bartlett. Indeed, a great lecture that should be required viewing for everyone, including our so-called leaders. In political and economic theory, the challenge of exponential growth has been known for a couple of centuries, since Thomas Malthus and David Ricardo initiated these discussions in the 1810's. Malthus was concerned about the proportional growth of food production (2+2+2), while the population seemed to be growing exponentially (2*2*2). In Malthus' perspective, this would lead to chaos, famine, wars, diseases, while Ricardo argued that the 'free market exchange' would ensure that things never got out of control. And here we are, two centuries later, and amazingly global food production is still higher than global food requirement (although the distribution of food has obvious deficiencies). It also turned out that population growth slowed down, once a certain level of economic wealth and stability had been reached, which nobody had anticipated, before it actually happened. It is my experience from political and economic fora I have joined that there is sensitivity around any social or economic factor showing exponential growth, and with the example of Colorado crime rates doubling in 7 years, it makes a very big difference if the growth was proportional or if it was exponential, my guess being it was proportional, as exponential growth of crime rates logically makes no sense at all. Luckily, global electricity generation or plastics production does not follow an exponential pattern (http://en.wikipedia.org/wiki/Electricity_generation, http://www.powerplantccs.com/ccs/cap/fut/c2p/plastics.html), but a proportional growth patter - even with decline in recent years due to the economic crisis. So I eat kiwis, drink Tahiti spring water (well, I don't do that), smoke a Havaneser at New Year, champagne from France, have a rum from Barbados, bananas from Honduras - and it goes on..
- and then I could go one month as 'eco-tourist' in the Amazonas..
As ridiculous as it sounds with Tahiti spring water, who will enforce the law that they cannot export spring water or enforce a heavy extra taxation due to the excessive environmental cost of transporting spring water around the world? European countries have protected local suger beet production and enforced import tax on cane sugar. Now, as part of fair trade agreements, the subsidies to local European sugar production are being removed, and import taxes on cane sugar is being removed, benefitting a number of developing countries, increasing their production and economic growth, getting kids to school, providing political stability and less political and economic refugees. This political aspect has been a major item of discussion in recent climate debates, where African countries argue for the need of economic development to reduce birth rates, famine, and political instability. Even with everything laid out on the table, this is just not easy.. Thank you Neven for posting this video. I have actually viewed it before but have just finished watching it again and it was refreshing to see our basic problem laid out so clearly and succinctly. I have been posting comments on the forum about the behavior of growth systems (capitalism) constrained by a finite resource (the planet)for the last 6 months. I would copy some here but there is no point in doing this as none of my observations are original. I would like to put it out there that I am not going to argue with the logic of exponential calculations. It is real. John......I read your comment with a growing dread as it seemed you were making a case for doing just that. You seemed to be arguing that there would always be that additional bottle found (food, energy etc) that would allow us to avoid our fate, ignoring entirely that it would simply buy us one more minute. Your last statement....."Even with everything laid out on the table, this is just not easy......." made me realize that this is not the case and has given me hope. First, you are absolutely correct. This is just not easy. While true, the very future of humanity depends on our eliminating the growth system that has provided us with all of the progress we have seen over the last 300+ years. By the way, I post under the name "Shared Humanity" for a number of reasons but one is that I am clear that all of humanity will share the same fate. When the Titantic sank, steerage and first class passengers died. Some did survive on lifeboats and this will likely be the case with us as pockets of humanity will survive the collapse but life on a lifeboat will scarcely resemble the sumptuous life that first class passengers had on the Titantic. If you would like to begin to explore solutions to the "Growth System/Finite Resource" dilemma, I would recommend the book "Thinking in Systems" by Donella H. Meadows. She is/was a brilliant woman who essentially founded (with some equally brilliant colleagues) "systems thinking" at MIT in the 1960's. One of the first realizations is that we (each of us) are part of this growth system and consciously and subconsciously do everything in our power to sustain the system. This is the nature of all systems. While this can be discouraging, it is also empowering as it suggests that individual behavior can, in fact, transform the system. Make no mistake. Growth systems, constrained by a finite resource all suffer the same fate. Collapse! This occurs as the growth system finally bumps up against these constraints and "Mother Nature" will be ruthless in imposing these constraints on human civilization. Her preferred methods will be famine and disease while humanity will chip in with war. Civilization as we know it will not survive. As the good professor explained, any success at postponing our fate by discovering more oil or technological innovation will simply allow another doubling and result in the collapse being more severe and horrific. What is most amazing is how close we are to this collapse. Certainly our children will see this but it is also true that many of the commenters here will see it as well. What happens to agricultural output when petroleum based fertilizers and pesticides are no longer available in 30 years? To begin to answer this question, we should look at the effects of the world wide "green revolution" in the 1960's. Wide spread famine was avoided and the world's population doubled in the ensuing 40 years. My guess is that the loss of these fertilizers will result in the halving of the world's population in as little as 20 years. 3 billion people will die of starvation and disease. Grim indeed. Bartlett's lecture is essential viewing for everyone. I can still remember the incredulity he expressed at the reply from a politician saying that the maths Bartlett outlined weren't relevant to claims that exponential growth in Boulder (?) was sustainable. That Dr Bartlett invested such time in touring and lecturing demonstrates how astute he was in recgonising the importance of the message he conveyed. "What is most amazing is how close we are to this collapse." Actually, this isn't surprising at all. It is another aspect of our collectives inability to understand exponentials. In exponential growth to a limit, the crash isn't immediately apparent (linear thinking) until the situation involves some significant fraction of the problem, often 50% or more. By that point, it is far too late to do anything about the problem. Whether it is algae in a lake, yeast in a dish, or any other problem. The problem isn't obviously apparent, until no solution can work, other than plateau and in short order collapse and death of the system. What makes this all so much worse is that we humans only appear to use science, the scientific method, and related tools. In reality, we rely on rhetoric to decide things. We start by deciding what we want, then apply rhetoric to select arguments from science and all sorts of other fields to bolster our arguments. The problem of course doesn't care what we want or desire. It is operating on physical principles and no amount of argument by us will change that. However, since we generally do not understand that and instead argue based on desires, we don't 'see' the problem until it eats us. Yes, Albert Bartlett was a good guy. But as most economists will explain you today, we have to restart the growth, otherwise we face a lot of problems. We cannot grow ourselves out of a problem whose root cause is growth. Capitalism's very existence, its reason for being is growth. Modern capitalism has been the method of organizing humanity for at most 200 years and has been in existence for no more than 400 years. As difficult as it is to face the issue, we need to create another foundation for human civilization. “Rutgers Today: In your paper dealing with sea level off the coast of New Jersey for the past 2,500 years, you and your co-authors conclude that sea level varied – down about 9 centimeters in the 750 years from 500 B.C.E. to the third century C.E. ; up by about 30 centimeters in the 500 years from the third to the eighth century; down 13 centimeters from the eighth to the 19th century. Since then, you and your co-authors say, sea level off our coast has risen about 50 centimeters in 160 years. What does this tell you about our current situation and the future? Horton: We’ve shown that the rate of sea level rise along the New Jersey coast is greater now than at any time in the past 2,500 years. This five-fold increase in the rate of rise can be attributed to climate change through the melting of land ice and the thermal expansion of ocean water. We also discovered that historic sea level varied in response to climate change. The data we have collected from the past help to calibrate and improve our models, which will allow us to better project sea level rise in the future. John says, "It also turned out that population growth slowed down, once a certain level of economic wealth and stability had been reached, which nobody had anticipated, before it actually happened." Which population are you referring to? I see no sign that the World's population growth has slowed. John also says, "It is my experience from political and economic fora I have joined that there is sensitivity around any social or economic factor showing exponential growth, and with the example of Colorado crime rates doubling in 7 years, it makes a very big difference if the growth was proportional or if it was exponential, my guess being it was proportional, as exponential growth of crime rates logically makes no sense at all." You just argued that crime rates are seeing exponential growth, then say it makes no sense, if your guess of proportional population growth is correct. Do you believe that the crime rate statistics are being falsified? Could you verify if the statistics you reference are falsified, and verify if your guess is correct? "John says, "It also turned out that population growth slowed down, once a certain level of economic wealth and stability had been reached, which nobody had anticipated, before it actually happened." I see no sign that the World's population growth has slowed." Was John referring to population growth _rate_? Even as population has grown, global population growth _rates_ have been declining since the mid '60s. There are different populations at work here, besides just raw numbers of humans . Take the population of jet engines in 1940, and today . I'd love to see a plot of that population. Or gasoline lawn mowers, and chain saws over the same period. We may bend the human curve, but the ecosystems of carbon burning machines we have made in the last 70 years is a vertical line. Tony, I am a high school science/math teacher and while I hadn't previously seen the video I have used the chessboard problem with my students only using pennies. I am also familiar with exponential functions and use them to explain problems contained in a number of topics. Please remember that a number of us "so called teachers" probably read this blog and use information contained here to help our students as well as ourselves make better decisions. SEATTLE -- A respected sea star expert released a report showing a deadly disorder has spread to more species. Neil McDaniel put together a overview of the so-called wasting syndrome which found it has spread from a relatively confined population in Howe Sound in British Columbia to up and down the entire West Coast, from California to Alaska. The report also expands two species to five and there be may be more. John this is a perfect example of our inability to grasp the exponential function. The world population growth rate has reduced but as the video adequately explains that even a very small but constant growth proportion leads to a very rapid increase. The doubling time has reduced to 30 years or so but in 30 years the world Population will DOUBLE. That is what we as humans don't instinctively grasp. Before watching the video I thought that as the population increases the increased population pressure will itself halt the growth but now I understand that it is a great expectation from the humans of the last 30 years(the last minute) to not only realize the problem but reverse the trend in time. Seeing the response to GW I am not optimistic. Regarding population growth, I should have made it clear that as a group of people (you could measure by national state or region of similar living conditions) reaches a certain level of living conditions (statistical analysis will show you that mortality rate is key to understanding living conditions), fertility rates will go down, as it will not be necessary to have as many kids to support yourself. The fertility rate (# of kids per woman) have been below 2 since 1972, so the limited population growth for the past fourty years have only been through immigration - immigration for economic and/or political reasons (http://en.wikipedia.org/wiki/Demographics_of_Denmark). When you look at global population growth rates, wili is correct that the population growth rate is NOT constant, as you see from the links, but is lowering, so there is no exponential growth in population globally. Politically, the argument is that you cannot get the population - or environment - under control until you have provided the level of living conditions, where a family can plan for themselves, have a couple of children, and these will be able to provide for the family eventually. The hope is also that developing countries can leap frog some of the development steps, allowing them to progress faster and with less material and environmental cost. Example would be tele communications, where some areas probably will not get land lines/cables, or even fiber cables, but move straight to wireless communications, thereby bypassing a lot of the infrastructure construction work that is no longer needed and becoming obsolete in 'developed' countries. For Colorado crime rates: That something doubles in seven years, does not mean it is exponential. If for 35 years it doubles every seven years, then you can discuss if it shows an exponential progression. But if that was the case every single citizen in Colorado would very soon be a criminal, which is why this example is perhaps less relevant. You can look at electronically stored data, and it should show near exponential growth. The hope is also that developing countries can leap frog some of the development steps, allowing them to progress faster and with less material an environmental cost. And so you, in fact, are arguing that we can grow ourselves out of a problem the root cause of which is growth. This is a recipe for disaster. "Hope" by the way is not a strategy. We don't live in a global dictatorship, so it is very difficult for any country-level politician, the USA, the EU, or even the UN to dictate local economic or social legislation in countries, where they have no official authority. It is also difficult to ask people not to buy a car they can afford, just because they live in a developing country. We have tried to 'buy out' the locals, where we buy their forest lands or place restrictions on what they can do with these lands, but compare that to what developed countries are doing with their own soil, and it is obvious that this is both completely unfair and in the long term not viable. The second option is by far the more democratic approach, and more viable in the long run, but let me hear if you see a third (or fourth) option here. I am not saying I think this is great, and I am also not saying this is sustainable, but it is very difficult to point to another way..
- And for fun Denmark facts I missed to mention that gasoline sales have gone down by 20% in the last five years due to smaller and more fuel efficient cars getting on the road.. These rates and the development of these countries (all countries) is really the only way of moving forward whether your objective is global food management, environment management or political/social stability, and as is seen from South Korea, it can happen a lot faster than the development of the US or old European countries. Sad news, and it is even more sad that this were not more important news. His lectures were truly amazing, very easy to understand. A giant indeed. As far as prosperity bringing lower birth rates wouldn't something like the GINI index play a major role? If a country's GDP moves upward but the wealth is concentrated in the hands of the elite the majority will continue breeding at high rates. The rich get richer and the poor get children still resonates. Doesn't trickle down economics act to keep birth rates high in regions where a more equitable distribution of wealth, security or privilege might exert downward pressure? Perhaps redistribution rather than growth could fuel the beast long enough to give us time to develop some alternative. I think that Cuba has shown that people can live happily on far less when what is available is fairly distributed & China has demonstrated that a one child policy can be enforced multi generationally. If the West could learn from these examples instead of attempting to reinvent the wheel we just might find a path toward a sustainable future. Unfortunately the old "Better dead than red." meme is still strong & they now insist on taking everyone with them in their ideologically driven rush to the cliff. You are absolutely right; there are more ingredients to the mix that I carelessly labelled 'living conditions'. GINI coefficient, infant mortality rates, access to health care, education, etc. all plays into the mix. If you only go for 'economic growth' and believe it will improve living conditions, the answer will have to be: perhaps. Therefore, focus need to be on finding ways to improve living conditions in the most sustainable way possible, as this will lower fertility rates, and overall help us get the global situation under control. USA does not have a great GINI coefficient and continued challenges with access to health care, so in spite of having a scary high level of material consumption, the fertility rate still hover around 2% due to poor living conditions for 45-55 millions of Americans, depending on how you measure this. It is several days since I watched this video, and decided, while sober, that it might be better if I did not comment. Yon professor makes some good points; (I shall store away, and use, his divide under 70 rule), but his lecture also contains some grotesque over-simplifications and evasions. To begin with, irrelevantly to my main point, to claim that anybody much was unaware that 2 to the power of 64 was really quite a lot is kinda dumb considering it turns up in either Genesis or Exodus, one or either, dating from the furthest limits of any written evidence. Next, he has to make some really sweeping assumptions about the population of his city, and totally ignore the fact that many of the people arriving there have vacated the countryside. Urbanisation. Get over it. Next, and my beef. And yon professor has clearly heard some of these critiques, and skirts them, or fudges them. First; population does not grow exponentially; and the concensus is actually that global population will start to fall by mid-century. Second; gross population numbers have very little to do with the build-up of greenhouse gases, etc. Last, just as any analysis of, say, the decline of Arctic Sea Ice which does not mention carbon dioxide is likely to be highly suspect, so also any discussion of population which fails to mention girls' education. If I missed the bit where yon prof highlighted the correlation between female education and declining fertility rates, fair enough; otherwise, to me, he's just some elderly white dude trying to invent reasons why the problems caused by elderly white dudes are really the fault of young black girls. Finally, no, dammit, I did 'last' above, but even so; I become very uncomfortable with 'environmentalism' when it merges into simple misanthropy. 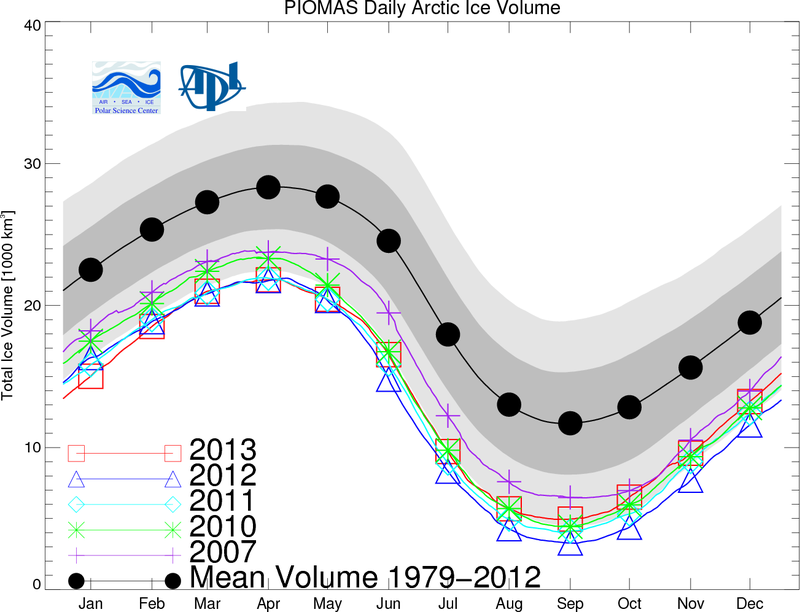 I have updated my graphics at ArctischePinguin for the latest data. My PIOMAS graphics update announcement has, as usual, landed in the spam box. They are to be found in the usual place. Being in the darkness of what I suppose is general destiny I think there’s no time even to consider these options. In short, as the old industrialized countries are near the treshold of economic collapse under the BAU scenario, the communities in these countries (i.e. Europe etc.) have only one option. Make the transition to zero-carbon, durable societies using the means still left. What other countries/societies do is up to their own responsibility. While remaining on speaking terms, the transition example is needed to display sincerity. Communities have to consider thorougly the meaning of wellbeing/development. Aid in case of ‘semi-natural’ (read AGW-enhanced) climate disasters should be given from the same source of sincerity and compassion. People might be far more willing to listen and adapt when such an agenda is followed. The notion/suggestion that material welfare ‘American/European Style’ can be achieved is ‘dreamland’. I hope you did not take my comments as an indicator that 'American/European Style' societies are the model, as the World certainly could not carry this kind of development for all countries. However, disregarding the few remaining tribes in the Amazonas and on a couple of islands in the Indian Ocean, the worldwide population is headed for development - for better or worse. We have 1.3 billion people in industrialized countries and 5.7 billion people in developing countries. So we need to focus on developing functioning societies for the 5.7 billion people, or it will be 7, 8, or 10 billion people to handle a few decades from now. In addition to this group continuing to grow, it will also mean lots of disease, wars, famine, and millions of refugees, which will not stop until local living conditions are up to minimum standards. So we will have more global warming, and more consequences from global warming, and the polar bears are not going to win. Some politicians are cowards, some are ignorant, but some are really trying to do the right thing. Often these politicians do not get rewarded by voters, who want quick gains, tax reductions, more jobs, so it goes back to influencing 'human choice', as I had in an earlier comment. Happiness is not the second car, the third LED TV in the house, or intra-continental vacations twice a year. And so John, you are still making the argument that the only solution to our dilemma is sustainable growth. This is, unfortunately, wishful thinking. When I posted earlier about growth system behavior constrained by a finite resource, I was not talking about population growth. Population growth is a symptom of the growth system which is capitalism. Fossil fuel consumption, CO2 production, automobile miles driven, GDP growth, internet traffic, bottled water drinking, top soil degradation, aquifer depletion, Manchester United valuation, David Beckham's salary ad infinitum are also mere symptoms or results of the growth system capitalism. This system depends on growth for its very existence. Follow any discussions in the public arena anywhere on the planet and you will hear policy makers stress the importance of growth. Make no mistake. All growth systems (capitalism), constrained by a finite resource (mother earth) face an identical fate, collapse. Terry did suggest some possible avenues to address the problem when he mentioned a "more equitable distribution of wealth". However, capitalism seeks the accumulation and aggregation of wealth and therefore only exacerbates global poverty. We simply need to face the fact that the growth system (capitalism) is failing us. SH, I totally agree with your post. I would just make a friendly amendment that, though capitalism is now pretty much the only game in town, the former USSR was also devoted to eternal growth (whatever system you want to say they were working under--but it wasn't exactly capitalism). Modern industrial society does seem to require an ideology that feeds it's machines most generously, and as history played out, capitalism seems to have been that did so the best. 4) Manage and improve existing development such that it a) copes with climate change and b) over-all reduces the "footprint" of industrialization and energy consumption. 5) Apply new technology to make the previous points possible. I share the intention to soldier on and refuse to despair, as we're all we've got, together, not apart. Maudling on about the difficulties, which I agree are huge, doesn't do much. However, even in the midst of that, there is some fine writing and thinking here, as usual. However, one hopeful note, if we would only act on it. It's pretty well demonstrated that women, given education, access to jobs, and access to birth control, choose to have smaller families. So we can hope the urge to repress gets stifled and women are empowered. Well, I guess I'm doing my part then, teaching in a women's college (actually a university, now). I don't often think about that aspect of the job, but iirc college educated women tend to have smaller families than those who don't get that education. Of course, if they consume at multiple times higher than their less educated sisters, that doesn't do much good. I do ask them all to take and reflect on the quiz at www.myfootprint.org and get them involved in ecological projects. No way of really knowing what long term effect these will or won't have, though. 2) We're closest to full agreement here, but the haves rarely give up much to the have-nots willingly. 3) Sorry, man. I just don't see this as a priority, at least not since I was about 14. 4) The very word "development" has come to mean something like "becoming more like the West" in most cases. When fully industrialized peoples see themselves as having to undergo "development" in order to live more like their the Koisan or like their ancestors five or six generations back (or more), then perhaps it may become a useful term for what needs to happen. 5) Technology = complexity, and as many theorists have concluded, complexity always creates its own problems that can ultimately be less and less effectively solved with yet more complexity. I'm not ruling out all innovations in tech; I just think, at long last, that we have to start acknowledging that most technological solutions tend to create problems about as fast as it solves them. In this time of political extremism, and media "balance" and industry mis-information and internet trolls, it is so refreshing to see clear rational thought and simple math as put forward by Bartlett reflected upon. Thank you Neven ! When we are faced with a finite resource like petroleum, of course it does not require exponential (some percentage per year) growth to get in trouble. In fact, linear growth and even no growth at all will deplete ANY finite resource over time. The question is not if fossil petroleum oil extraction from our planet can be done in a "sustainable" way as some oil companies are claiming. We already know that is NOT sustainable. Not under ANY consumption curve, exponential, linear, or flat. So the question is not IF, but WHEN will we switch to alternatives to fossil petroleum ? We HAVE TO at some point... When is that point ? We know that a finite resource like petroleum will probably follow some sort of bell curve. We also know that "conventional oil" already peaked in 2006 or so. Overall world oil extraction is still increasing simply because we are now digging into "unconventional oil" supplies, such as Canadian tar sands, shale oil and (most interesting to this forum) entering extreme places like the Arctic, to postpone the inevitable. But when extraction and thus consumption still increases, the problem only gets worse. 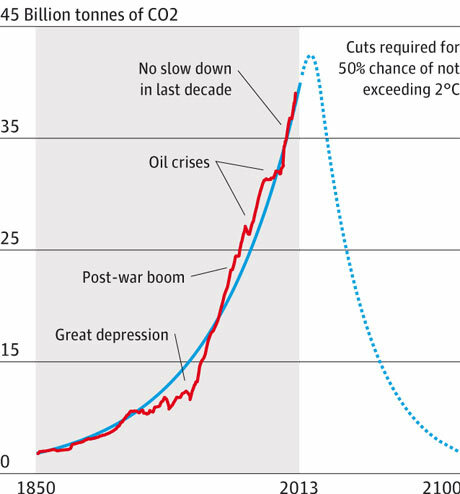 To give some perspective on the time pressure we are under, consider that any new petroleum resource that we will discover and extract from now on will only postpone the inevitable decline to the right side of the Bell curve. For example, Prirazlomnaya (the first production rig in international waters of the Arctic) is drilling into the Prirazlomnaya which contains some 440 million barrel recoverable oil. Even at current rate of global oil use (some 88 million barrels per day), Prirazlomnaya will only delay the inevitable downslide on the bell curve by 5 days. Think about that. 5 days. As for all the 90 billion barrels of "undiscovered" oil that is supposed to be available in the Arctic, even at current extraction/consumption rate, we can delay the inevitable decline of fossil petroleum supplies by about 2.8 years. Would we risk an ecological catastrophe in the last ocean on this planet that has until now been a sanctuary for wildlife due to it's ice cover, the ice cover that is disappearing because of burning fossil fuels in the first place, just so that we can stay addicted to a fossil fuel for 2.8 years longer ? My question is : Are we NUTS ? Change NOW ! Declare an Arctic sanctuary NOW ! And NO, Russia. It's NOT cool to throw anyone protesting against this insanity of Arctic oil exploration in jail without a trial. It's NOT cool to confiscate their vessel in international waters, and it is NOT cool to ignore an international court order to release the vessel and the protesters. It's NOT cool to drill in the Arctic.